Making a tissue diagnosis of pancreatic adenocarcinoma is best accomplished by EUS and fine-needle aspiration (FNA) of the lesion. Typically, a dark, or “hypoechoic” mass will be seen, which presents an obvious target for FNA. For small lesions, computerized tomography (CT) may be negative, but the lesion is still almost always seen on EUS imaging. Rarely, a pancreatic mass will appear isoechoic on EUS imaging. We report three “invisible” pancreatic masses identified only by a cutoff in the pancreatic duct (PD) and/or common bile duct (CBD). No mass, isoechoic or otherwise, was seen. EUS-FNA was performed in the area of ductal narrowing, with a positive identification of adenocarcinoma in these cases. 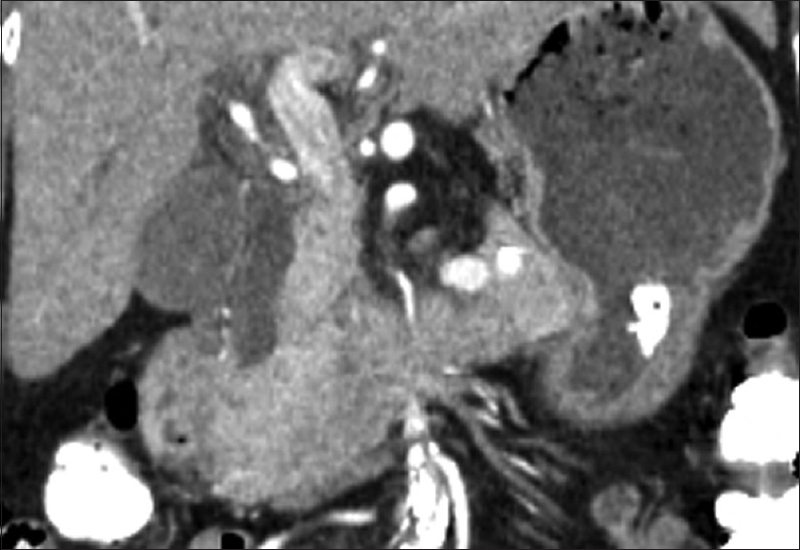 Malignant pancreatic tumors typically present with a mass on contrasted computerized tomography (CT) imaging. Occasionally, no mass is noted on CT, but EUS can demonstrate a hypoechoic lesion. EUS-FNA can then yield a positive diagnosis in a very high percentage of cases., A pancreatic mass can be isoechoic and difficult to see with EUS, but this still represents a good target for EUS-FNA. We have encountered 3 cases of “invisible” pancreatic malignancies in which the suspicion for malignancy was high, but no mass (isoechoic or otherwise) was seen on EUS. The presence of a cutoff of the common bile duct (CBD) or pancreatic duct (PD) could be seen, however, and fine-needle aspiration (FNA) of this region was positive for malignancy. A 71-year-old female presented with painless jaundice, dark urine, and acholic stools. She described a 5kg weight loss over the prior 5 months. On examination she was jaundiced, with a normal abdominal examination. Laboratory findings demonstrated total bilirubin 8.4 mg/dL, serum alkaline phosphatase (AP) 1074 U/L, serum alanine aminotransferase (ALT) 664 U/L, and serum aspartate aminotransferase (AST) 1252 U/L. CT showed a 10-mm CBD with distal tapering, no PD dilation, and no mass in the head of pancreas (HOP). The pancreatic parenchyma was normal [Figure 1]. EUS demonstrated CBD dilation with an abrupt cutoff in the HOP, but no discrete mass. The PD was not dilated. No important vascular structures showed invasion. Doppler-guided (for all cases) FNA in the HOP at the level of the ductal cutoff [Figure 2] was positive for adenocarcinoma. A 64-year-old male presented with 2 months of painless jaundice and a 5 kg weight loss. The patient had previously been a heavy smoker and drinker. The physical exam was significant for jaundice; the abdominal examination was unremarkable. The total bilirubin was 18 mg/dL, AP 962 U/L, AST 149 U/L, and ALT 125 U/L. CT demonstrated a maximum CBD diameter of 19 mm with a distal tapering. The PD measured 5.5 mm in the head, also with significant tapering. No distinct pancreatic lesion was visualized [Figure 3]. EUS did not show a mass in the pancreatic head, and there was no evidence of chronic pancreatitis. The CBD and PD were dilated up to a cutoff in the HOP [Figure 4]; FNA was performed in this area. Cytology was positive for adenocarcinoma. 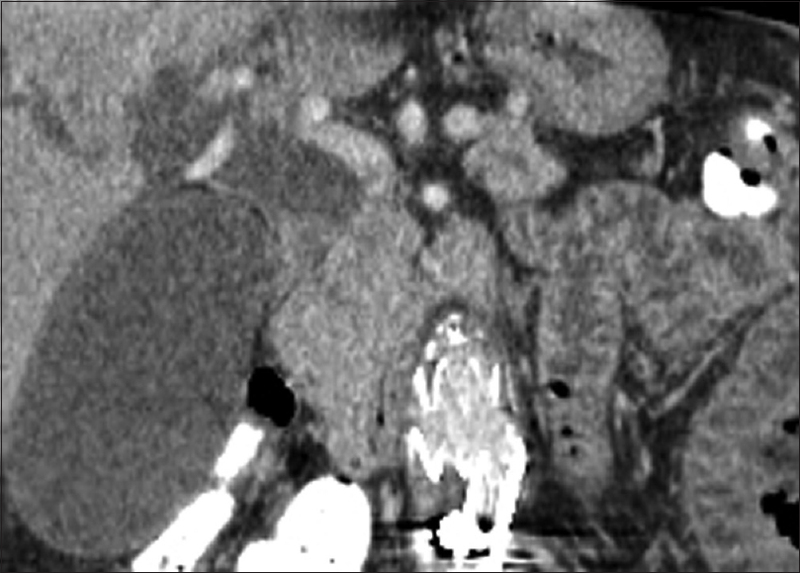 A 55-year-old woman presented suddenly with abdominal pain; acute pancreatitis was diagnosed on the basis of a CT scan and hyperlipasemia. She continued to be symptomatic with abdominal pain, particularly with meals. Repeat imaging done 3 months later showed dilation of the PD to 5 mm, without a discrete mass. She was referred for EUS evaluation of the PD dilation. In the week before the EUS procedure, she noticed darkening of her urine. EUS was done, which showed dilation of the CBD and PD, but no mass apparent at the level of the caliber change. FNA was done in this region—two passes were made with a 25G EUS-FNA needle without onsite cytopathology. Smear and cell-block results showed adenocarcinoma. ERCP with biliary stent placement was done. The first 2 patients underwent pancreatic head resection (the third is awaiting surgery). Final pathologic staging was T3N0 in Case 1 and T3N1 in Case 2. Review of the pathology was done to try to understand why the lesions were invisible on EUS. In both cases, there were infiltrative tumor cells and glands widely separated by desmoplastic reactive tissue, and no localized mass of glandular tumor cells alone. However, the appearance was not very different from similar cases of pancreatic adenocarcinoma that the pathologists have encountered before. EUS-FNA is the most sensitive and specific test for evaluation of pancreatic tumors, especially for tumors smaller than 3 cm in size., Pancreatic adenocarcinoma typically appears on EUS as a hypoechoic mass with indistinct margins. Pancreatic endocrine tumors and metastatic lesions to the pancreas are more commonly homogenously hypoechoic, round, and well circumscribed. Rarely, pancreatic tumors may appear isoechoic, making them difficult to see by EUS. Pancreatic masses that are not detected with standard imaging modalities are very rare. In this report, we describe 3 cases of pancreatic adenocarcinoma in which no mass was seen at all, and the diagnosis was made by FNA in the location of an abrupt cutoff of the PD or CBD. Pancreatic malignancy is rarely missed on EUS, but it is important to have a “cancer until proven otherwise” approach. EUS sensitivity is decreased in calcific chronic pancreatitis with shadowing stones, or soon after an episode of acute pancreatitis. Diffusely infiltrating cancer may not demonstrate a discrete mass on EUS, but in general shows a hypoechoic and enlarged pancreas, which still presents an adequate target for FNA. On occasion, EUS in chronic pancreatitis can demonstrate a hypoechoic mass-like lesion that is not a malignancy. Serial imaging, including repeated EUS-FNA, may be required to completely rule out malignancy, and in those cases that remain unclear, a pancreatic resection may be required. There are emerging techniques that may increase the yield in diagnosing a pancreatic malignancy in unclear cases. 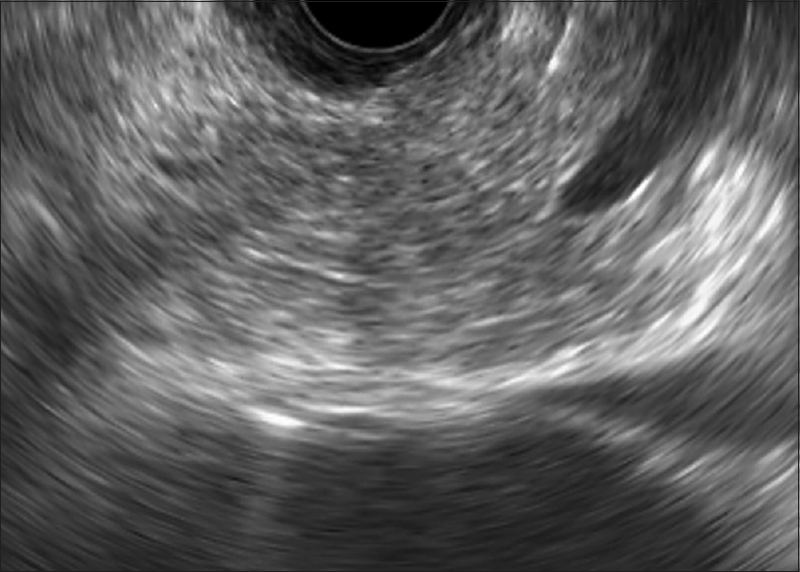 Tissue elastography and contrast-enhanced ultrasound have been used on an investigational basis, and may hold promise in those rare cases., However, these techniques are not widely available for use in clinical practice. 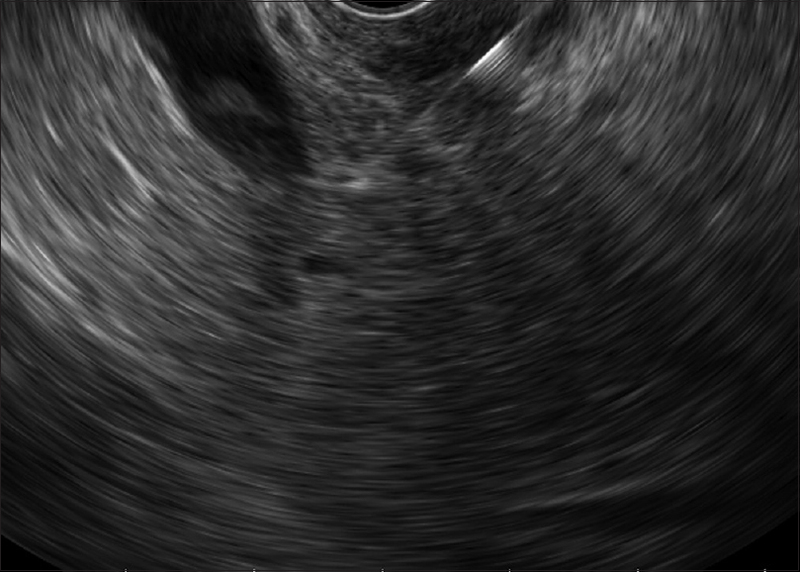 In addition, these techniques are typically used when a mass is actually seen on EUS, and chronic pancreatitis or malignancy are the diagnostic possibilities. Given the low complication rate of EUS-FNA, it is reasonable to perform FNA of a suspicious area even if no mass is seen. The reason that the tumor was not visible in these cases is not entirely clear, but the microscopic observation of diffuse infiltration with desmoplasia may contribute. The cases described here suggest that the “ductal cutoff sign” (an abrupt caliber change of the pancreatic and/or and biliary ducts in a patient with a high suspicion of malignancy) can provide an important clue for where to target FNA to find an “invisible” pancreatic malignancy. Cieslak KP, van Santvoort HC, Vleggaar FP, et al. The role of routine preoperative EUS when performed after contrast enhanced CT in the diagnostic work-up in patients suspected of pancreatic or periampullary cancer. Pancreatology 2014;14:125-30. Hewitt MJ, McPhail MJ, Possamai L, et al. EUS-guided FNA for diagnosis of solid pancreatic neoplasms: A meta-analysis. Gastrointest Endosc 2012;75:319-31. Volmar KE, Vollmer RT, Jowell PS, et al. Pancreatic FNA in 1000 cases: A comparison of imaging modalities. Gastrointest Endosc 2005;61:854-61. Palazzo L, Borotto E, Cellier C, et al. Endosonographic features of pancreatic metastases. Gastrointest Endosc 1996;44:433-6. Chan M, Scaife C, Thaker HM, et al. Adenocarcinoma of the pancreas undetected by multidetector CT, endoscopic ultrasound, or intraoperative ultrasound. J Pancreas 2009;10:554-6. Bhutani MS, Gress FG, Giovannini M, et al. ; No Endosonographic Detection of Tumor (NEST) Study. The no endosonographic detection of tumor (NEST) study: A case series of pancreatic cancers missed on endoscopic ultrasonography. Endoscopy 2004;36:385-9. Popescu A, Săftoiu A. Can elastography replace fine needle aspiration? Endosc Ultrasound 2014;3:109-17. Alvarez-Sánchez MV, Napoléon B. Contrast-enhanced harmonic endoscopic ultrasound imaging: Basic principles, present situation and future perspectives. World J Gastroenterol 2014;20:15549-63.